I hope you like my fashion posts because I have more prints of pretty dresses to show you today. Enjoy! 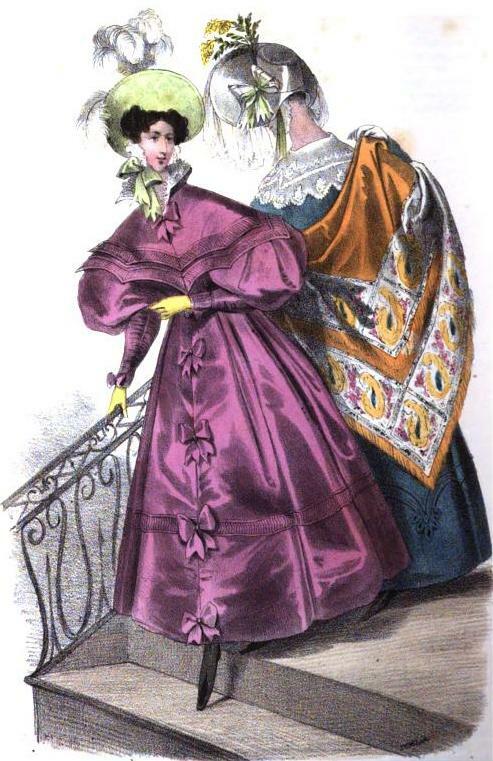 Pelisse of arbre de Judec, gros de Indes; the corsage is made high, plain, and covered by a double cape, broad on the shoulders, each cape is edged with a band of satin, of the same colour as the dress; plaited or crimped into minute folds, and edged with cording. Another and similar band heads the hem of the skirt, which is fastened down in front, by bows of satin ribbon; hat of green velours epingle, trimmed with satin ribbons, and a plume of elegant white feathers; bottines of kid. A dress of bleu Adelaide merino, trimmed with rouleaux, high corsage, and plain, full Amadis sleeve, collar of beautifully embroidered net or muslin; amber-coloured Cachemire shawl, with a rich double border, of a delicate pattern on a white ground. Hat of white moire, ornamented with a bunch of laburnum, and tied with white figured ribbon; a deep blonde curtain surrounds the brim, which is also trimmed inside with a blonde ruche. 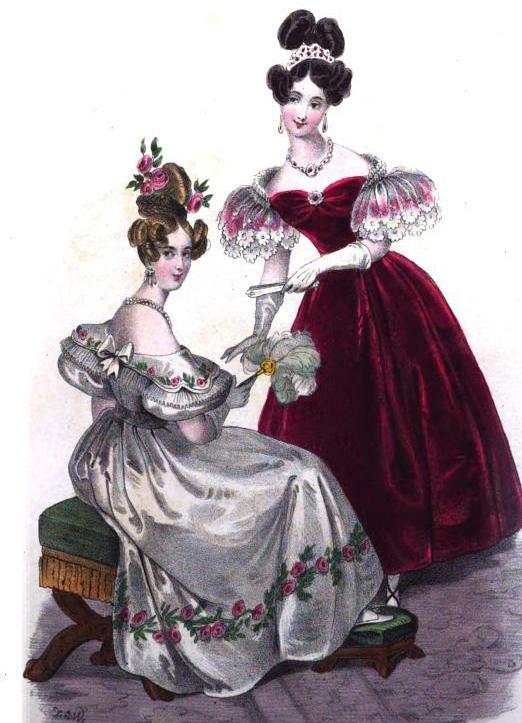 Ball dress of white mousseline de soie over satin, the corsage is cut low, plain, and square, and is completely covered by the pelerine, which is of pink satin edged with blonde. The front and back pieces are separate, and shaped en fichu, the short point reaching even below the band, while the other ends, which are much longer, cross over the sleeve, and are fastened to the strap which confines it round the arm; this pelerine is without opening behind, and is fastened on each shoulder by a noeud of six coques of ribbon; the band round the waist is of satin like the pelerine, and finishes he hind with a noeud like those on the shoulders. The skirt is trimmed with large slanting scallops, formed by three rouleaux; to each of the points, placed uppermost, is fastened a sprig of pink reine marguerite with foliage, issuing from a leaf of satin edged with blonde. The hair is dressed in Grecian plaits, with a marguerite on each side, and one rising from behind the comb; the jewellery should be gold or pink topaz. White satin gloves and shoes. 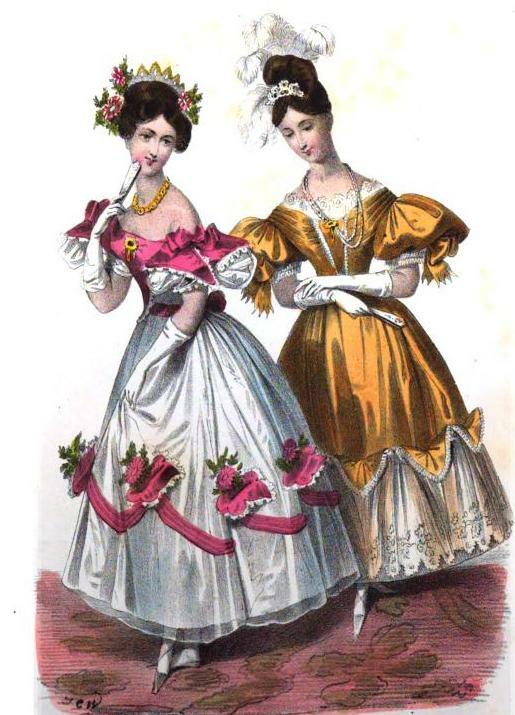 A dress of oiseau de paradis satin, the corsage is drapé across the bust, with a stomacher in front, edged with narrow blonde delicately quilled; the sleeves are short, and fall in very full bouffants over a double ruche of quilling which confines it to the arm; just above it, in the middle, is placed a bow of satin ribbon, with long ends. A blonde chemisette shades the bust. The skirt set on in deep double plaits, en colonnes, and is finished by a superb flounce of blonde, headed by a row of triangular fan like ornaments, edged with quilling. The hair is dressed plain in front, with a full spreading coque on the crown of the head, behind which is placed a plume of white feathers; one, the longest, is brought more in front, so as to fall over the right temple. Necklace, sevigne, and aigrette of pearls and emeralds. Shoes and gloves of white satin. 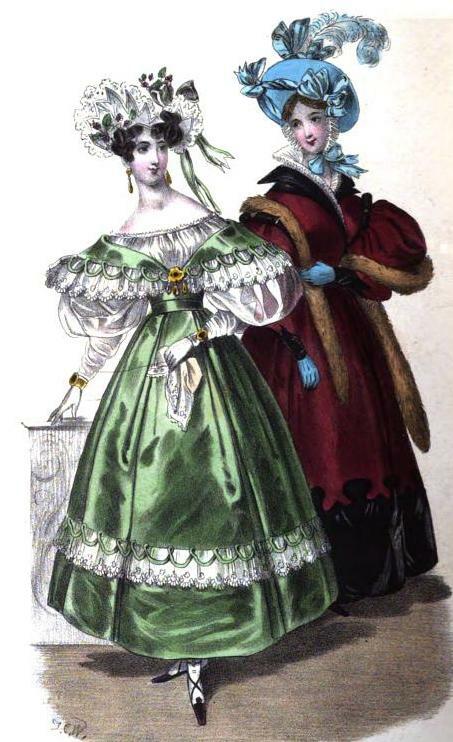 A dress of Pomona green Irish poplin. The corsage is extremely low, and open en pointe both before and behind. The lapels which turn down en fichu are cut gradually increasing in depth on the shoulders, and diminishing at the points, they are edged with deep blonde; a rouleau, set in scallops à jour, partly over the lapels, and partly over the blonde, gives a very elegant finish to this garniture. The hem of the skirt is low, and surmounted by a similar trimming of blonde and scallops. The corsage de dessous is of tulle, as well as the long sleeves, which are of the full amadis form. The coiffure consists of two deeply vandyked ailes of white satin, edged with blonde; a bunch of violets is placed above the curls on the right side; while on the left, where the coiffure is less high, is placed another smaller bunch, and a bow with two very long ends, one of which falls as low as the shoulder. Violet satin shoes. Sevigne, earrings, and bracelets of gold and amethyst. A pelisse-robe of claret cachemire Francois. The corsage is close to the shape, and open in front, crossing over considerably on the left side. The opening of the skirt is concealed by the depth of the folds. The collar, which is very narrow, and has the appearance of turning over, is of black velours epingle, and is divided on the shoulders, where it forms two dents; the cuffs are of the same material, as well as the deep hem, and the epaulettes – the latter are made a l’Espagnole, in separate corded loops, and completely surround the top of the sleeve, although they rather diminish in size and depth as they reach the under part of the arm. Hat of blue moire, trimmed with gauze ribbon and one large feather tipped with blue. Bottines of kid. Light blue gloves. Sable boa tippet. A dress of rich white satin, the skirt is very full, and is embroidered above the hem, with a wreath of small roses in their natural colours; the corsage is plain, the upper part concealed by a deep round pelerine of fluted tulle, over which falls a lapel of the same material as the dress, embroidered with leaves and rosebuds. The lapel is cut in three scallops on each shoulder. Full beret sleeve. The hair is dressed with a bow and braid, and two sprigs of roses, the one much larger than the other. Pearl jewellery. White satin gloves and shoes. Ceinture of embroidered satin. A rich robe of amaranthe velvet, the corsage has a Sevigne drapery across the bust, and is plain behind. A ruche of tulle goes completely round the back, terminating in front of each shoulder. The sleeves are full and short, and covered by a superb double fall of blonde. The skirt has no trimming, but is set on the band in full double-fluted folds, reversed en colonne, which gives the velvet a singularly rich and splendid appearance. Diamond and ruby necklace, earrings, and Sevigne. Was Count Fersen Really Marie Antoinette’s Lover?